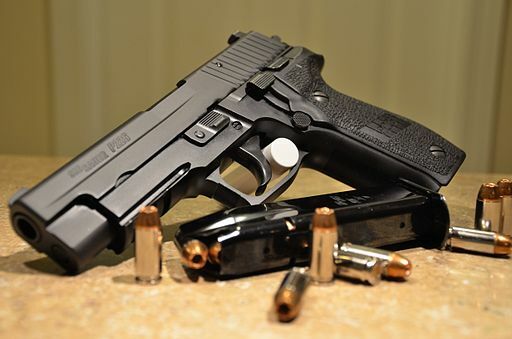 The SIG Sauer P226 is a full-sized, service-type pistol made by SIG Sauer. It is chambered for the 9×19mm Parabellum, .40 S&W, .357 SIG, and .22 Long Rifle. It is essentially the same basic design of the SIG Sauer P220, but developed to use higher capacity, double stack magazines in place of the single stack magazines of the P220. The P226 itself has spawned further sub-variants; the P228 and P229 are both compact versions of the double stack P226 design. The SIG Sauer P226 and its variants are in service with numerous law enforcement and military organizations worldwide. The SIG SAUER® P226® is the pistol that set the standard by which all other combat handguns are measured. The exceptional ergonomics and balance make this fullsize pistol easy to handle. Its longer barrel yields better ballistic performance and accuracy. The P226 MK25 is identical to the pistol carried by the U.S. Navy SEALs-the fleet’s special warfare operators. The railed P226 chambered in 9mm and engraved with an anchor on the left side of the slide is the official sidearm of the SEALs.